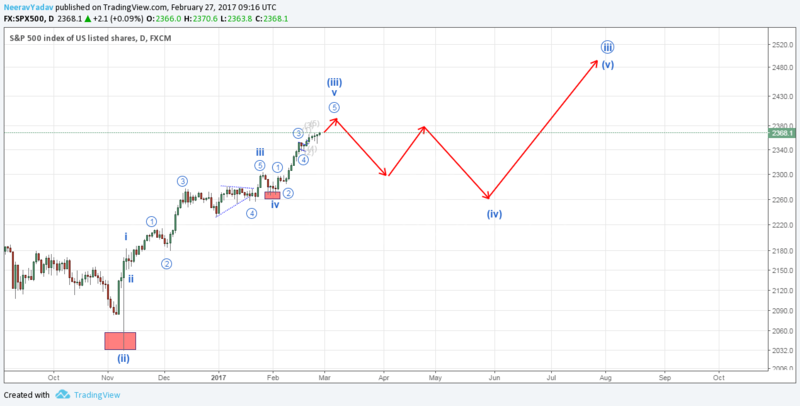 Previously I published a report on 17/7/2016 in which I specified that SPX should achieve a level of atleast 2370 which was achieved on 24th Feb 2017 and hence I will be looking at the current wave progression and the future targets for the SPX using Elliott Wave. From the count below it seems that SPX is currently in the Wave 3rd of the 3rd which is either complete or will get completed near the 2380 mark or above, after which we will see probably a Zig Zag type of correction in the weeks to follow. For a detailed Elliott Wave Analysis of SPX and to know the Wave Counts down to the Hourly time frame do view the video report below.